Diamonds Are Forever (1971) is the seventh spy film in the James Bond series, and the sixth to star Sean Connery as the fictional MI6 agent James Bond. The film is based on Ian Fleming’s 1956 novel of the same name, and is the second of four James Bond films directed by Guy Hamilton. The story has Bond impersonating a diamond smuggler to infiltrate a smuggling ring, and soon uncovering a plot by his old nemesis Blofeld to use the diamonds and build a giant laser satellite that would be used to hold the world for ransom. 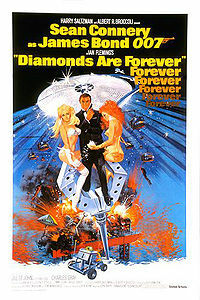 Diamonds Are Forever was a commercial success, but its humorous camp tone was met with mixed reviews from critics.